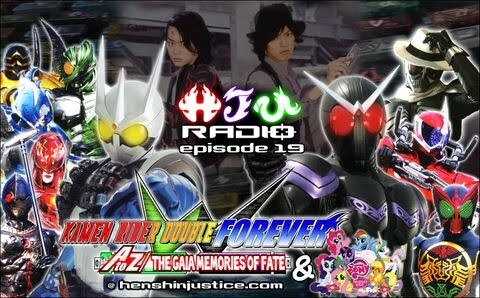 With the release of Kamen Rider W FOREVER: AtoZ/Gaia Memories of Fate, Henshin Justice Unlimited released a podcast that talks about the awesomeness of the movie. But not only that, Koichi Sakamoto, the lead action director of Power Rangers, Ultra Galaxy Legends and Kamen Rider W FOREVER, liked and responded to it! 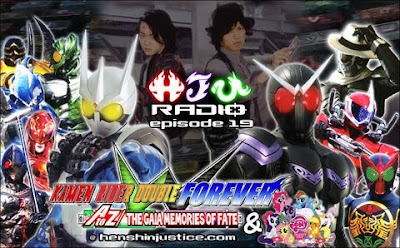 HJU Radio #19 tackles many things including Kamen Rider OOO, My Little Pony, Toys, Tetsuo, Supernatural, Super Robot Wars: The Inspector, Darksiders, The Cape, ONE PIECE, Doctor Who, Spartacus: Gods of the Arena, Kaizoku Sentai Gokaiger and Kamen Rider W: Forever the Gaia Memories of Fate. Download and check out HJU Radio #19 here!